The bPart is a sensor node with Bluetooth Low Energy (BT LE) radio and several off the shelf MEMS sensors, all highly integrated in a volume of less than 1cm³. Aside from the BT transceiver, the bPart features a light sensor, 3-axis accelerometer, temperature sensor, humidity sensor, battery, processing unit and a multicolor RGB-led for user feedback, as well an infrared led for camera-assisted tracking. Runtimes of several years are possible on a standard CR2023 lithium coin cell, through the low energy radio, onboard power-conversion and low-power sleep modes. The latter is rated below 2µW and a single data packet consumes about 75µWs. Its low energy consumption makes it suitable for operation with energy harvesting. Another advantage of BT LE is that it is supported on nearly all modern desktop and mobile operating systems, facilitating the connection to existing devices. On the software side, the bPart supports easy configuration of both sampling and transmission intervals. The complexity of the Bluetooth software stack is abstracted in a high-level interface, enabling data-collection and -analysis on a mobile phone, as well as forwarding and aggregation of sensor-data in the backend. While the bPart itself is designed as a fully integrated solution, the concepts and general architecture are easily adaptable to other sets of sensors and has various applications in cyber physical systems and smart environments. 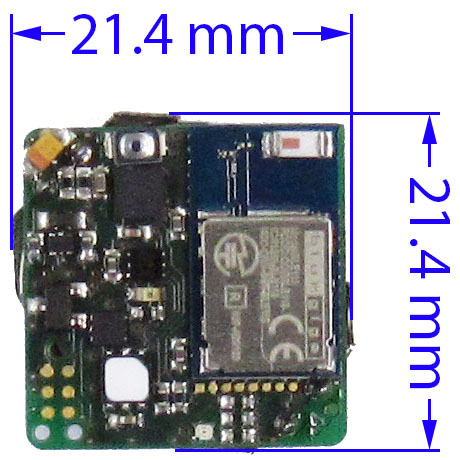 Its size and energy consumption allow different applications, ranging from long-term monitoring, where existing equipment is retrofitted with unobtrusive sensors, low power motion detection, live data acquisition and visualization in Produktion 4.0 settings or monitoring of logistics processes. Detailed information can be found in the device summary. More information here.